The Teacher Feature is an ongoing series of interviews with the wonderful instructors from our Atomic Ballroom Family. In addition to celebrating our instructors and their many achievements, we would like you all to learn more about them as people – why they dance and what makes them ‘tick’. 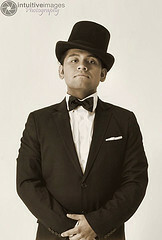 Today we are highlighting Lindy Hop and Classical Jazz Dancer, Teacher and Performer – Mikey Pedroza. So when did you start dancing (lindy hop)? And what drew you to swing dancing? I started dancing Lindy Hop back in 1998, I was 13 years old then. My brother had been going to a local swing dance night club called Memories for a few months and decided to take lessons. After his first few classes, he came home at night and showed me what he had been learning. It involved a lot of kicks and touching the ground, I didn’t know it at the time but it was Charleston. He showed me quickly how to do it and I was hooked. A few weeks later I was in my first swing dance class. I loved it! I made friends with many of the students in the class who were about my age and we all decided to continue learning together. By the end of that summer, I was taking not only swing classes but also taking ballroom lessons and also involved on a team of kids my age doing Lindy Hop routines. For the next year I would dance and compete in ballroom with my partner Cassandra and dancing Lindy Hop for fun and going to camps. Soon ballroom just wasn’t doing it for me and I was having way more fun with Lindy Hop. I couldn’t really say what drew me to it specifically but girls for sure helped. Also, I never was really good with people or public speaking – I found that through dancing, I learned that it was okay to be me by drawing on the inner confidence I had always had. So I guess the draw was that I was finding out more about myself and getting comfortable with that. You’ve been dancing for almost 15 years! What has kept you going all these years? The things that kept me going was really that knowing that I could always get better and that there will always be something new to learn. But also how much fun I could have. I had never been this good at anything in my life and dancing was actually something I was good at and it got me excited, it still does. As I got older and adolescence set in, I forgot about a lot of this stuff, I forgot why I loved it and just did it. Then that spark of joy was re ignited when I met my friend Laura Keat. She showed me that the dance can be experienced in a different way. I had been dancing with the left side of my brain for so long that I didn’t notice that I could use the right side and actually think about what I am doing on the dance floor and be aware of my body at all times but still keep that artistic and free flowing part of me evident in the dance. Well, in those many years you have become well versed an a NUMBER of vernacular jazz dances (ie Balboa, Lindy Hop, Blues, Solo, etc). Do you have a favorite style or type of dance? I will and forever love and cherish Lindy Hop. It has helped me live my life. And it’s given me a creative outlet to let my minds inner working come out thru joy and movement. Who or what has been your biggest influence or inspiration in your dancing? My first inspiration was watching old movie clips and soundies from back in the day when the dances were being created. I remember when my brother showed me my first clips, Dean Collins in Buck Privates, Pete Smith Specialty Goovie Movie , and of course Whitey’s Lindy Hoppers in Hellzapoppin’. I’ll never forget that day, it changed the rest of my life. From then on I was in constant search for more videos. White, black, brown what ever color the dancers were didn’t mater to me as long as they could teach me. Lately my inspiration still come from those old clips that I can now call on will right from my lap top. When I feel stagnant or I need a little spark to light my imagination I call upon those clips and sit and learn. But also I must say that I have since branched out and enjoy watching other dance styles: ballet, modern, hip hop, ballroom, tango – anything that moves with a beat…I will take the time to watch it. But really, my biggest influence in dance would have to be Frankie Manning and Gene Kelly. Frankie manning for his innovation and his ability to show you the love for Lindy Hop. And Gene for showing the world that dance can be done by anyone and that you don’t have to be fancy or a girl to dance. You made the move from dancer/performer to teacher…what’s that been like? Is there any particular method or advice you try to convey to your students? Being a dance teacher isn’t something I set out to do all those years ago. It wasn’t even on the radar. Teaching, for me, just kind of happened. I was asked to teach in Oberlin, OH in 2004 and thought, wow, maybe I should start teaching more. So ever since then I have tried my best to teach others what I do. But first, I had to figure out what I did and how I could to convey it – that was the hardest thing for me. But thru this, I discovered that being true to yourself is what cherish and love about the dance. I love to be creative and fun but as long as I am aware of what I am doing and stay in control of my body. I take it upon myself to share that knowledge and love with everyone. Body awareness is the biggest thing I convey to my students. That means a lot of exercises to learn what your body does in certain situations. I also like to remind my students that even though they are in my class, what I say is not the end all-be all “way of Lindy Hop.” It’s just my interpretation and all I can do is teach you what I do. I encourage them to go out discover different ways of approaching the dance from different teachers. I guess my method would be that it’s not about right and wrong but what feels good and not so good, being aware of what your body is doing. Advice wise, don’t come to class drunk. Unless your at a bar I don’t come to your work and get drunk. Seriously, I don’t want to have to make fun of you for an hour, though it would be fun for everyone else I don’t think you’ll learn much unless your one of those functional drunks or something… yeah. You also seem to love to perform – solo, with your partner and with a performance group – Can you tell us more about what that process is like and what you love about it? How do you deal with nerves? Your right, I do love performing and competing and Lindy Hop lends itself to both of these things. The dance is so big that you are performing no matter what. And a lot of the dance is also all about “one upping” the other guy/girl. If you ask my mom, she would tell you that I was always meant to be in front of people and entertain them…I guess that’s why she would call me Mr. Hollywood as a kid. But for me, the nerves never go away and before every contest or performance I am always a ball of nerves. The first really big contest I did, was U.S. Open Swing Dance Championships in 1999, and we were the last couple up after about 13 couples before us. I thought it was a good idea to sit down thru out the first 12 couples and when the couple before us started, I got up only to fall right back down because I couldn’t stay standing on my feet! All of the nerves for me are during the times before I dance but as soon as I hit that floor it goes all away and I finally get into my comfort zone, Lindy Hop! This is going to sound incredibly silly but its the weird truth in my head… when I get out there and perform I like to think about the Japanese anime, Dragonball Z. When they are about to fight they charge up their powers and emit this huge glowing aura that everyone near by can see and feel. When I am dancing in front of people that is what I try to shoot for. I want people to not just see what I am doing out there but I want them to feel the dance. Advice for performers would be to find a way to connect with the audience and try your best to make every performance unique and something special for yourself. It will translate well to the audience. Of your many competitions and performances, do any stick out in your mind as favorites? My favorite performance would have to be Tears with Nikki Marvin. That was such an amazing piece of work for us. We had no idea how it would be received by an audience. The song isn’t really something you can clap along to like most Lindy Hop routines and neither is it like most routines. We drew inspiration for this piece from various dances: tango, salsa, French apache and of course Lindy Hop. We took a long time in putting that routine together and loved every minute of it because it was uniquely us. My favorite competition has to be the Camp Hollywood 2008 where with Nina Gilkinson did 10 swing outs in a row and had that entire place on its feet for every single one. It was one of the greatest feelings i have ever felt during a contest and I will never forget that. I was there …the room was electric! So what are your goals for the future? You’re a pretty ambitious guy…Will we be seeing you on tv/movies, stage, owning a studio or putting on a dance event? Well, a little over a year ago I set a goal of working or performing at 3 major events: performing at Houston’s Southwest Lindy Fest, teaching at the home town event of Camp Hollywood, and teaching/performing at Herrang Sweden. And to my surprise, I accomplished those goals with in a year! So now my new goal is to be a part of a large stage production. I want to dance in front people and make them want to jump on stage and dance along with me. Are you working on anything special to reach your goal? Mainly I am working a lot on myself right now. I am taking a jazz and ballet class to help get some new techniques in my body and hope to use those new skills in my Lindy Hop. Do you think there is anything missing (something you’d like to see change, return, more of, less of…) in the swing world? I love dancing, it has helped my life so much and helped me travel the world. Teaching for me is more about spreading the knowledge and love I have gained thru the dance. I’m not out to change lives by any means, but if I can help some one learn something new and brighten their day a bit, then I’m happy. Mikey Pedroza, ULHS 2012 Slow Dance Champion! Check out the video below. Shani Brown discovered swing dancing in the late 90s as she eased out of gymnastics into a new physical activity. When she moved to Orange County in 2000, she discovered a whole new world of Balboa and Lindyhop - and she's been obsessed ever since! When she's not hitchhiking to dance events across the country, she's probably got her nose in a book...And when she's not dancing, she's probably talking about dancing or watching dancing and being a typical dance-geek.